The Great American Recession resulted in the loss of eight million jobs between 2007 and 2009. More than four million homes were lost to foreclosures. 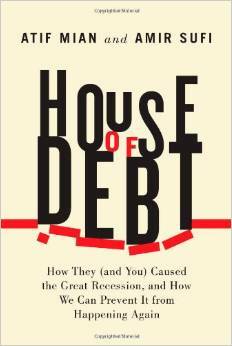 Is it a coincidence that the United States witnessed a dramatic rise in household debt in the years before the recession—that the total amount of debt for American households doubled between 2000 and 2007 to $14 trillion? Atif Mian and Amir Sufi write about how the Great Recession and Great Depression, as well as the current economic malaise in Europe, were caused by a large runup in household debt followed by a significant drop in household spending. Mian and Sufi provide data to suggest that current policy is heavily biased toward protecting banks and creditors. Increasing the flow of credit, they show, is disastrously counterproductive when the fundamental problem is too much debt. Their research shows that excessive household debt leads to foreclosures, causing individuals to spend less and save more. Less spending means less demand for goods, followed by declines in production and huge job losses. To end the cycle the authors say we can be rid of painful bubble-and-bust episodes only if the financial system moves away from its reliance on inflexible debt contracts. As an example, they propose a new idea for mortgage contracts that are built on the principle of risk-sharing, a concept that would have prevented the housing bubble from emerging in the first place.